Ha ha – I know just what you mean, Ela! Oh yes, I really could eat one right now. Wonderful!! I think this is the best “anytime” food, right Suzanne? This is my favorite kind of sandwich, especially since you grilled the eggplant. The sandwich looks so inviting, it practically jumps out of the picture onto my plate. I bet you enjoyed it. It was a “sink into, get comfortable and it wouldn’t have been bad if I died right then and there” kind of sandwich!!! I love a good beef stroganoff and I’m sure you’ll all walk away from the table with full tummies. That’s right – you need to eat this with people you love and who love you – so no one cares about the messy mouths!! Happy Bday to your son! What a beautiful looking sandwich. That’s something I’d eat again and again. Thanks Amanda!!! I’m with you on the again and again part! Thanks Marie!! And Happy Birthday to Jessica too!! Oh, Mary Frances! You’re singing my song. This is one good-looking sandwich. I’d love to sit down to one of these. 🙂 🙂 🙂 Thanks John!! It’s always, all about the ingredients, and with these, you can’t go wrong, right? What a beautiful tradition. I am sure once the work is done and you all gather to eat, all you will be thinking is how much you love them all. Meanwhile on my birthday I want this sandwich. LOL – Well this sandwich is a much, much, much easier request!! Hope you have a happy one, whenever that is!! What a tasty looking sandwich! I can just imagine sinking my teeth into that one! YUM! Love all the flavours in this sandwich! 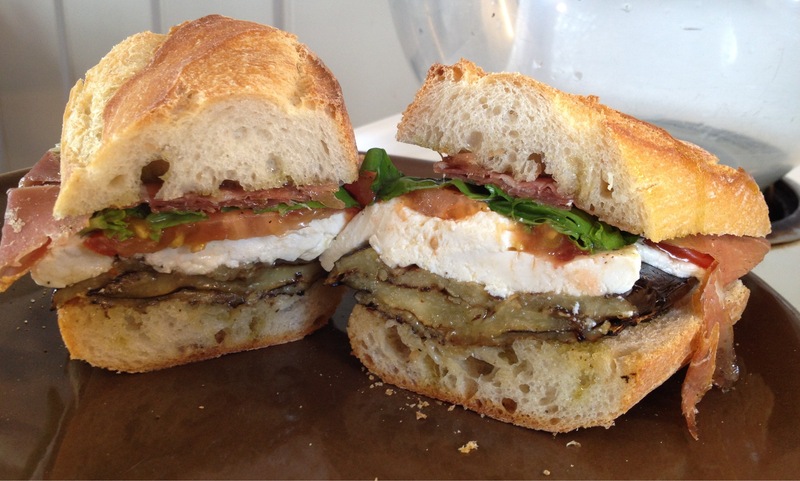 Eggplant is wonderful fried and out in between some bread. Simple but perfect. Yes totally!! Simple, with wonderful quality ingredients, is the best in my book! Happy Birthday to you son! 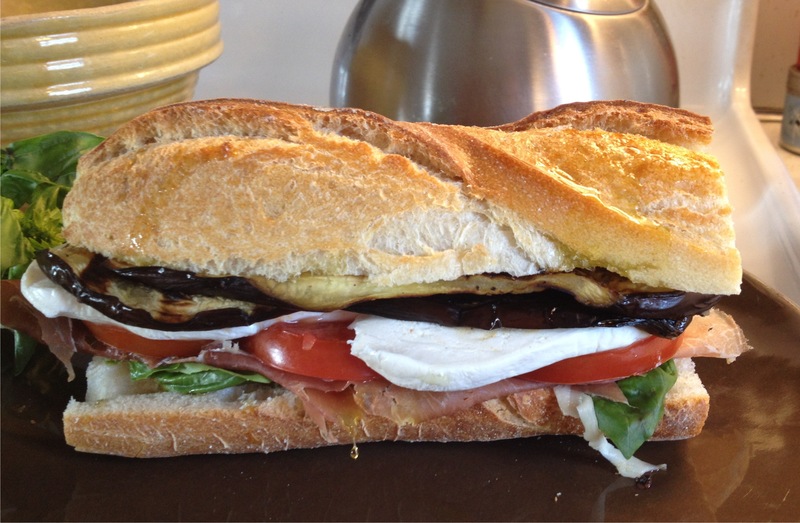 I love grilled vegetables and putting all of those yummy things on a toasty french bread is brilliant. That’s a very good idea. Somehow though, I never get that answer. Thanks Lorraine!!! The stroganoff was delicious – but too much work in my book! Oh, my. I’m picking up some eggplant this week so I can make this for dinner! Seriously fabulous!! Thanks Liz!! It was a really yummy sandwich!! Me too Denise!! 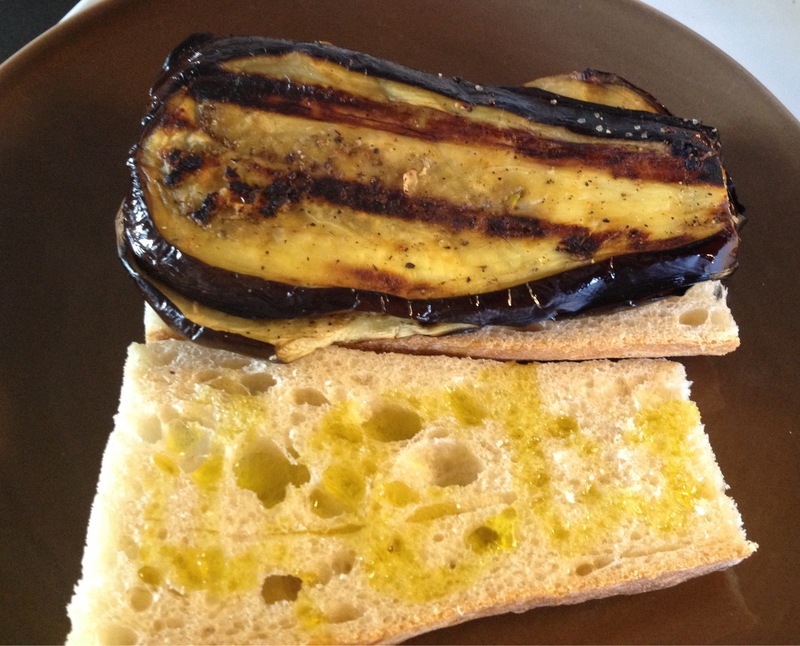 I adore eggplant – and grilling it with just a little olive oil is the way to go, instead of fried. I’m now following you on Twitter – maybe see you there sometime when I’m not too peckish!